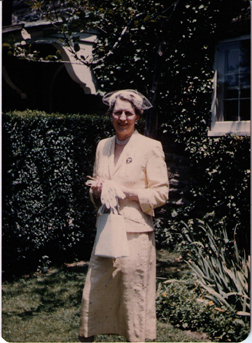 Zelia Pauline Zigler, known to us as Zee, was born in Portland, Oregon on June 20, 1903. She was named for an Aunt, and was called Zela by her family. Several years ago Zee collected and wrote a history of her family and how they each arrived in Oregon. One Grandfather, Lewis Henry Zigler, was born in Botetourt, Virginia and drove a covered wagon from South Bend, Indiana, over the Oregon Trail to Portland. Her other Grandfather, Samuel Sykes, born in Leeds, England, sailed to Philadelphia and then sailed for 140 days around the horn of South America to San Francisco, then on to Portland. One Grandmother, Sarah Mary Plymale, was born in Galesville, Illinois, and rode with her seven brothers and sisters, to Salt Lake City, south/west half way across Nevada, then north to Jacksonville, Oregon via the treacherous Applegate Trail. Her other Grandmother, Delia Kerrigan, born in Dublin Ireland, sailed to the Isthmus of Panama, trekked across the Isthmus on a mule to the Pacific coast, where she sailed on another ship bound for Portland. Zee's father, Frederick Martin Zigler, born September 25, 1865 in Jacksonville, Oregon, was a printer and gentle, artistic man. Her Mother, Caroline Hardy Sykes, born July 21, 1867, in Portland, was a businesswoman, ahead of her time, who with great sales & organizational ability put together & directed her Brother's political campaign & got him elected County Clerk. Fred and Caroline were married on February 22, 1899 in Rosburg, Oregon. Their first daughter, Zelia Pauline, arrived on June 20, 1903. A second daughter, Helen Beryl, followed on July 5, 1906. Fred Zigler built a house on East 40th Street in Portland and moved his family there in 1907. It was a newly developed residential area and the girls found no playmates within several blocks. For that reason they became closer companions then most little girls with 2 1/2 years difference in age. They both attended the Fernwood Grammar Scholl, on an unpaved country road, which housed all 8 grades in one large high ceiling room, heated by a large pot-bellied iron stove. The sanitary facilities were outdoors, about 50 feet from the back of the building, but there was one faucet with only cold water, in the entrance hall. The girls roller-skated to school, at least 10 blocks each way, everyday, except when snow or ice forced them to walk. At age 16 Zee had her first job with the Oregon Journal as a part time sales woman for the classified advertising department, over the telephone. When she graduated from Washington High School, having had a taste of advertising through several part time jobs, she pursued the same field of study at Oregon State College. During her freshman year, Zee became friendly with a group of 14 girls, who had formed a club using a Greek name. The Club applied to a national Fraternity, Kappa Kappa Gamma, in an effort to become a local chapter at Oregon State. The national officers were impressed with the 15 young women and on October 6, 1924 initiated the girls as founding members of the Gamma Mu Chapter. While a student, Zee wrote a research paper that won a contest and helped her obtain her first full time job in Portland for the Oregon Voter Weekly Magazine. Soon San Francisco seemed to offer greater opportunities and Zee found a job in the advertising department at the Shell Oil Company. In that position she organized the "Shell Traveling Service" an idea she developed to help customers find their way an where to stay, when on vacation. In a short time she had 14 employees working for her the Shell Oil offices in San Francisco. Shell Oil then sent her to develop the same department in St. Louis and New York City. Zee always loved to travel, beginning in 1936 when Shell Oil Co. sent her to the San Diego Exposition to handle their information bureau. In 1939 she was sent to The Golden Gate International Exposition in San Francisco to conduct sales shows for various merchandising meetings and assist in training Shell Oil dealers. During World War II, Shell Oil Co. found a shortage of service station attendants, as men went off to war. Zee suggested to the high brass, that they train women to replace the men to pump gas. She wrote a training manual, designed appealing uniforms, to make the women look professional and soon the women proved to do as good a job as the men. Another problem during the war for women, left at home to take care of everything, included the family car. To solve that problem, Zee wrote an illustrated booklet entitled "Alice In Motor Land". The booklet compares a car's gearshift to an eggbeater, using similarity between kitchen utensils and auto parts to make the car's components more understandable to homemakers. Leaving the Shell Oil Co., after 13 years, Zee found herself in New York City as the war ended. Searching for a new position she wrote articles for McCalls and the Tide magazines and wound up working for the world famous advertising company, Young & Rubicam. The Curtis Publishing Company hired her next, to make her the first woman to sell a line of advertising for the new Holiday magazine, first published in December 1945. This position required a move to Philadelphia, where she became Manager of the travel information service at Holiday. Soon after her move she met and married Clayton McElroy, Jr. a Philadelphia banker, known as Mac. While continuing her position at Holiday magazine, Zee volunteered her time for Pennsylvania Hospital, founded by Benjamin Franklin as the first city hospital. Her love of flowers and her talent for flower arranging, which she attributes to her sister Helen, led her to donate hundreds of arrangements for the Hospital to sell in their Gift Shop. Zee and Mac traveled as much as they could, after they both retired, until Mac's death in 1966. She then continued to be involved in clubs and Philadelphia organizations. The publisher of Holiday magazine had been Edward Von Tress. Upon his retirement, Ed Von Tress moved to Bloomington to become Secretary of the IU Alumni Association, having graduated from the School of Journalism. On a return trip to Philadelphia, he contacted Zee, courted her for a few months and convinced her to marry him in 1969 and move to Bloomington. She was overwhelmed by the Hoosier hospitality and the loyalty of IU Alumni. She immediately became involved with several local organizations, including the Bloomington Hospital, which publicly commended her for her donation of hundreds of floral arrangements for their Gift Shop to sell. Zee and Ed did a great deal of traveling around the United States as well as abroad, over the next 7 years, until Ed passed away in 1976. In 1975/1976 the Retirement Housing Committee of IU researched the development of a non-profit retirement community to be built on property owned by IU. Zee became a member of the IURC Board of Directors and was able to use her many years in business and marketing to help work through several difficult years in the organization, funding, construction and decoration of what is now Meadowood. 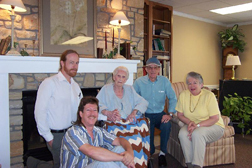 Zee moved into a lovely apartment at Meadowood and continued to be involved in as many aspects of the living community as she could find time for. From Meadowood, she continued to travel around the US and abroad. In May, 1993, Zee flew to Jacksonville, Oregon, where her Grandfather had settled and discovered gold. The Zigler family continued to own a small piece of land along Jackson Creek. A teacher at an elementary school on the adjoining property, contacted Zee, asking if her family would agree to donate the land to the school, to be preserved as a park and woodland, rather than allow developers to build houses there. Zee agreed to the donation and the teacher and his 4th grade students made a video about their efforts to acquire the property entitled "If Trees Could Talk." The video was submitted to a contest, sponsored by The Weekly Reader Corp. in Middleton, Conn. Where it won the grand prize, a Pentium powered computer. Zee presented the video to the Meadowood community on January 14, 1997. In September, 1994, Zee, at age 91, and her Meadowood companion, Ruth Golinkin, flew to Salt Lake City, rented a car and stopped first at Robert Redford's Sundance resort, to view the blaze of fall colors. They then headed south to see all of the Utah National Parks, from Arches to Zion. Next came a drive into northern Arizona, through Monument Valley and the north rim of the Grand Canyon, followed by a whole day seated on a flatbed truck to tour the spectacular Canyon de Chelly, which she considered one of the world's great natural wonders. After 2 weeks and 2000 miles, Zee and Ruth returned their car in Salt Lake City and flew back to Meadowood. Zee continued to reside in the Meadowood Health Pavilion, where she insisted she received the best care anyone could ask for. 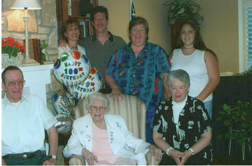 She celebrated her 102nd Birthday on June 20, 2005, and passed away September 25, 2005. She was interred in the Zigler Family vault at Alta Mesa Memorial Park, 695 Arastrodero Rd., Palo Alto, Ca. 94306 650-493-1041. 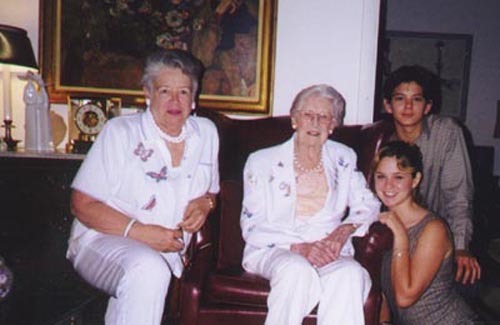 Her sister Helen, and brother-in-law are also in the vault.